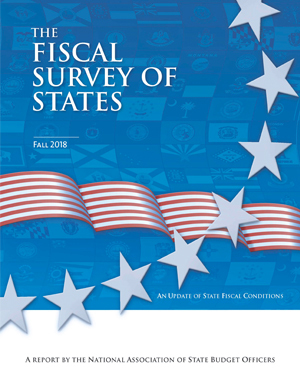 With data gathered from all 50 state budget offices, this semi-annual report provides a narrative analysis of the fiscal condition of the states and data summaries of state general fund revenues, expenditures, and balances. The spring edition details governors’ proposed budgets; the fall edition details enacted budgets. State fiscal conditions continue to show signs of improvement and greater stability. According to enacted budgets, state general fund spending is expected to grow 4.3 percent in fiscal 2019 compared to fiscal 2018 levels, with all program areas seeing increases in appropriations. States enacted appropriation increases for fiscal 2019 totaling $41.1 billion across all program areas, compared to just $12.7 billion in new appropriations enacted in their fiscal 2018 budgets one year prior. Only 7 states made mid-year budget cuts due to a shortfall in fiscal 2018, totaling $456 million. General fund revenues grew a robust 6.4 percent in fiscal 2018, led by a 9.8 percent increase in personal income tax collections. 40 states saw general fund revenue collections come in higher than budget projections in fiscal 2018, the highest number of states to do so since fiscal 2006. General fund revenues are projected to grow 2.1 percent in fiscal 2019 based on forecasts used to enact state budgets, with a median growth rate of 2.3 percent. States enacted a mostly modest mix of tax increases and decreases, many in response to the federal tax law, with a net estimated revenue impact of +$3.1 billion in fiscal 2019. States continue to strengthen their reserves, with the median rainy day fund balance as a share of general fund spending expected to rise to 7.3 percent in fiscal 2019, from a recent low of 1.6 percent in fiscal 2010. The Week in Public Finance: With Revenues Soaring, States Are Spending More. But on What?